Contemporary large-scale paintings and sculptural hybrids are on view in NO MAN’S LAND: Women Artists from the Rubell Family Collection. The exhibition imagines a visual conversation between 37 women artists from 15 countries exploring images of the female body and the physical process of making. 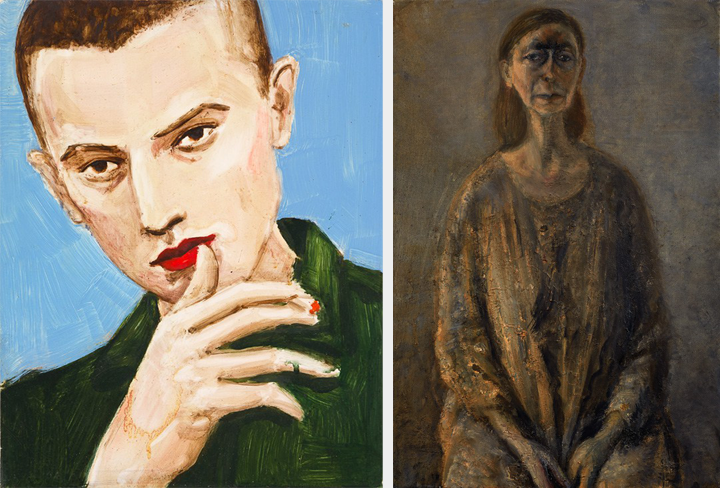 Paintings by Elizabeth Peyton, Celia Paul, and Rozeal combine personal and art-historical references. Elizabeth Peyton (b. 1965, Danbury, Connecticut) paints friends, family, celebrities, and personal heroes. “There is no separation for me between people I know through their music of photos and someone I know personally,” she explains. Peyton works with ideas surrounding celebrity culture, much like Andy Warhol—an artist to whom she is often compared. Her use of vibrant color and graphic style also recall the Pop artist, but unlike him, she does not accept commissions from her famous sitters. This portrait depicts the German gallerist who has represented Peyton since 1995. Like many of her male subjects, Riemschneider is shown with slightly feminine features, such as red lips and high cheekbones. “My work has always been autobiographical,” says Celia Paul (b. 1959, Trivandrum, India), who, like Peyton, paints only people close to her. She almost solely depicts women—most often her sisters, her mother, and herself. Her color palette is strikingly somber, relying heavily on brown and gray, which she sees as “true to the colors of London.” Paul credits her use of color to fellow artist and former lover Lucian Freud. Self-Portrait is exemplary of Paul’s signature style, featuring rapid yet controlled brushstrokes, an elongated figure, and an unembellished background that offers little sense of time or place. The impression of mystery and darkness is compounded by the artist’s expressionless face. The intersection of contemporary hip hop culture and traditional Japanese ukiyo-e printmaking is the basis for Rozeal’s painting. When the artist (b. 1966, Washington, D.C.) heard about ganguro, a Japanese movement among young girls in the 1990s who darkened their skin and dressed as their favorite hip-hop stars, she was both fascinated and angered. The discovery of ganguro, which translates as “blackface,” propelled Rozeal to explore issues of race, gender, and class in her work. Sacrifice #3 is based on an 1888 woodblock print by Tsukioka Yoshitoshi that depicts a courtesan. Though she assumes a similar pose, Rozeal’s subject has darker skin, long acrylic nails, and full lips. Sacrifice #3 works to expose the stylistic appropriation of African American culture. Reserve a spot to meet artist Rozeal at NMWA on October 18, 2016 for a special in-gallery conversation. Visit the museum and explore NO MAN’S LAND, on view through January 8, 2017. —Casey Betts was the summer 2016 digital engagement intern at the National Museum of Women in the Arts.